Newsome’s Zach Benson celebrates after tying the game in the bottom of the eighth inning. The final eight teams all earned their spot in the champion’s bracket of the 36th annual Saladino Tournament, which finished up pool play action on Tuesday. Pool winners were Alonso, Brandon, Freedom, Plant, the Riverview Sharks, Steinbrenner and Strawberry Crest, and Robinson earned the wild-card bid. The champion’s bracket will begin Wednesday morning, with all remaining games held at Tournament Headquarters at Brandon High. Even for the teams that did not advance, Wednesday brought plenty of excitement and positive results for clubs to now take into the stretch run of the season. After dropping their first two games, Newsome scored a nice win in a back-and-forth battle with Gaither in Pool G.
Danny Neely dropped down the second straight suicide-squeeze bunt to plate the deciding run and lift Newsome to a 6-5 walk-off victory in extra-innings, in one of two contests played at Pepi Stadium on the University of Tampa campus. After Zach Benson came in to tie it on a squeeze-bunt from Alec Titmus that also advanced Austin Spires within ninety feet of ending it, Neely laid down another superb bunt to walk it off. With the game knotted at 4-4, Gaither’s Kenny Rodriguez reached on an error, advanced on a single from Camryn Williams and came home on another miscue to put the Cowboys (7-6) in front. The Wolves (9-5) got things going as Joey Raffaele singled and Spires doubled to right to put two runners in scoring position. An intentional walk to Cody Shook loaded the bags and set the stages for some fundamental play-calling that plated the deciding runs. The late game at Pepin Stadium featured the Riverview Sharks against the upstart Brooks DeBartolo Phoenix to decide the pool winner. The Sharks got the bats going right away to take a 6-0 lead after two innings and never looked back for an eventual 13-2 decision. 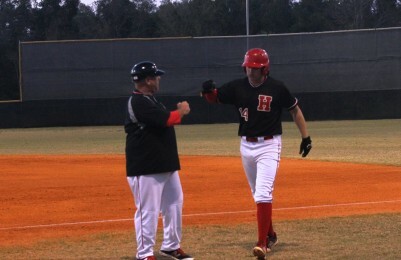 Nick Romano is congratulated by one of his coaches after his quality at bat produced a sac-fly RBI. Justin Farmer singled to lead off the game, Garrett Thompson reached on error and Josh Rulli walked to load the bases. Darius Stribling sent a liner past third to clear the bags and later made it 4-0 thanks to an RBI single from Zach Stenbeck. Thompson added a two-RBI triple an inning later as part of his 3-for-4 performance. Despite the big deficit, the Phoenix (5-8) did not hang their heads and continued to battle the entire way. Xavier Rodriguez ended the shutout with an RBI single that brought in Luis Andujar in the fourth, before Rodriguez also came around to score on a fielder’s choice off the bat of LeAndres MaHoney. Sickles prevailed in a back-and-forth battle with Hillsborough to keep its hopes alive, as the Gryphons just missed out on a wild-card berth. The school served as one of the four hosts in the opening round, and fans in attendance were treated to an exciting offensive performance in the final action there on Tuesday night. A four-run fifth inning broke a 2-2 tie and put Sickles (6-8) in the driver’s seat, and a pair of runs an inning later proved to be the difference in an eventual 8-6 victory over the Terriers. Greyson Butler led the Sickles bats by going 2-for-3 with four RBIs and a run, and Dylan Eskew was 2-for-4 with an RBI and a run. The Terriers (8-5) made one last push in the bottom of the seventh, plating three runs to nearly even things back up and force extra innings. 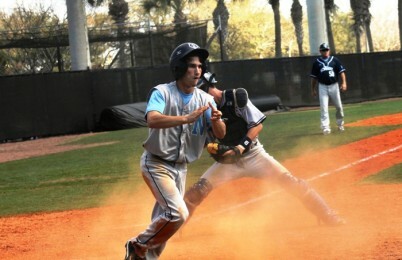 Tim Elko led the Hillsborough batters by reaching base all four plate appearances with two walks and two hits. Rodnie Bernard was 2-for-4 with two runs.